Macrophyte biomass control includes measures to restore aquatic plant communities in order to take advantage of the beneficial aspects of plants in lakes, as well as meas ures to control excessive growth that results in conflicts with certain lake uses or to eradicate exotic species. Scientific background. Aquatic macrophytes, especially submerged species, are of significant importance for the food web interactions and environmental quality of lakes, as they affect the interactions between predacious, plank tivorous, and benthivorous fish, and between fish and invertebrates. Submerged macrophytes play a crucial role in shallow lakes due to the vegetation turbidity feedback (Figure 1). They stabilize the clear, vegeta tion dominated state due to the reduction of nutrient availability to phytoplankton, enhancement of top down control of algae by providing refuge for zooplankton, suppression of phytoplankton by the excretion of allelopathic substances, facilitation of phytoplankton sedimentation, and prevention of sediment resuspension. Loss ofsubmerged macrophytes in shallow lakes results in a switch to the turbid, phytoplankton dominated state (Figure 3). In shallow lakes, the successful establishment of submerged macrophytes is therefore a prerequisite for the long term success of other restoration measures such as food web manipulations. Excessive macrophyte growth can be a result of eutrophication or of increasing water transparency after the application of restoration measures to eutrophic lakes. Control measures are only needed when macrophytes hinder certain lake uses (e.g., recrea tion). As nutrient demands of rooted macrophytes are largely supplied from the sediment, reduced in lake nutrient concentrations will not result in reduced macro phyte growth in most cases. 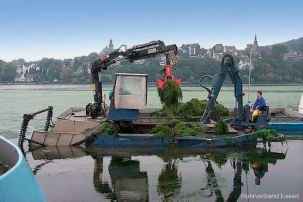 Figure 10 Macrophyte harvesting in one of the Ruhr reservoirs (Germany). restoration method applied only decreased turbidity for a period too short for natural colonization, if submerged macrophytes are immediately needed for the successful development of introduced pike, or if the promotion of specific (e.g., low growing) macrophyte species in parti cular areas of the lake is required to enable recreational use. Methods to control or eradicate aquatic macrophytes include water level drawdown for a period sufficient to kill the plants and their reproductive structures, mecha nical harvesting (Figure 10), sediment covers, aquatic herbicides, and biological control such as phytophagous insects and fish and plant pathogens. In shallow lakes, macrophyte control measures should be applied with caution due to the risk of a switch back to the turbid, phytoplankton dominated state. Table 1 summarizes the available options provided by ecological engineering for controlling excessive phyto plankton growth due to eutrophication as well as for reducing other undesired symptoms of a high trophic state.